Balanced dynamic dual-rail gates and asynchronous circuits have been shown, if implemented correctly, to have natural and efficient resistance to side-channel attacks. 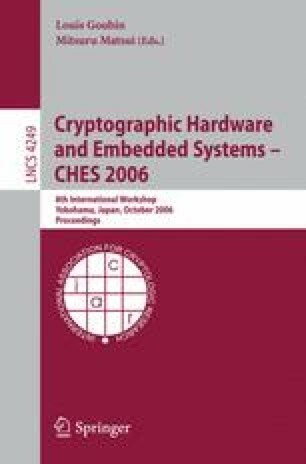 Despite their benefits for security applications they have not been adapted to current mainstream designs due to the lack of electronic design automation support and their non-standard or proprietary design methodologies. We present a novel asynchronous fine-grain pipeline synthesis methodology that addresses these limitations. It allows synthesis of asynchronous quasi delay insensitive circuits from standard high-level hardware description language (HDL) specifications. We briefly present a proof of concept differential dynamic power balanced micropipeline library cells that are approximately 6 times more balanced than the best (differential dynamic) cells designed using previous balancing methods. An implementation of the Advanced Encryption Standard based on these balanced cells and synthesized using our tool flow shows a 6.6 times throughput improvement over the synchronous automatically pipelined implementation using the same TSMC 0.18μm technology synthesized from the same HDL specification.